First, it has been 4-5 months since I worked on this, but I've had a couple people ask for some instruction. I showed this off back at CarolinaCON and even flashed one from scratch for some friends there. So, the instructions may be a bit rusty and you may have to do some extra legwork. 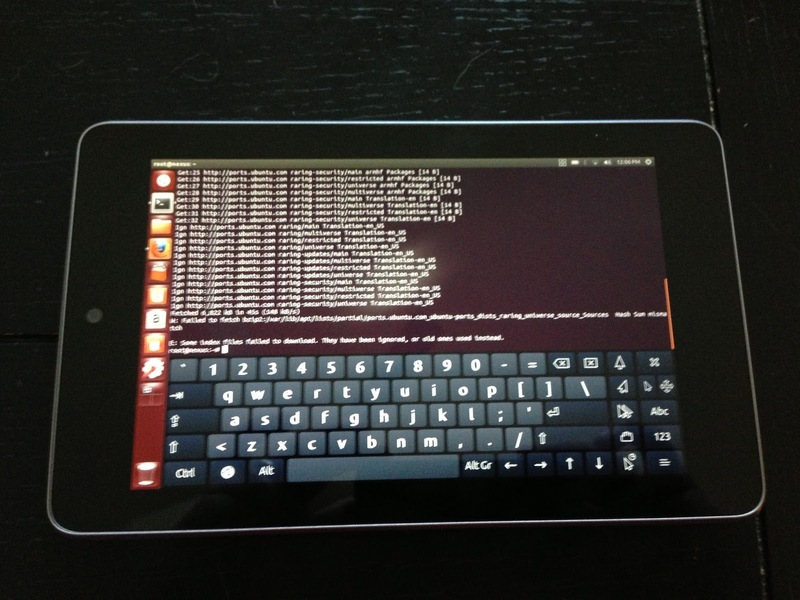 In 2012 I read about developer builds of Ubuntu for mobile devices, specifically the Google Nexus series of tablets. On an off weekend, I was able to pickup a 32GB Nexus 7 locally for $250 (16GB is $200) and took an evening tinkering. To my surprise, I was able to get full-blown Ubuntu 12.10 installed with most hardware working correctly within a couple hours! At the time, I remember some issues with bluetooth drivers, webcams, etc., but the only frustrating part was a semi-glitchy touchscreen due to Ubuntu not technically supporting touch interfaces at the time. Almost everything worked, but there were some workarounds needed. Last I tried, Ubuntu 13.x was supported and was more stable and handled touchscreen input better. I won't go into boring detail here…you can get very thorough instructions HERE. If I was able to follow it, so can you! Yes, you can reinstall Android if you change your mind later. Also, keep in mind this is NOT "Ubuntu for Android"! This is FULL-BLOWN Ubuntu and functions as such. Review the release notes and forums for details on issues and workarounds you may encounter. Battery life was not particularly awesome in my experience on the 12.10 builds. Surprisingly, the Ubuntu update manager and software center work pretty well even though it is on an ARM CPU. I was able to get Nmap, and other scanning tools available there to install no problem. Ubuntu recognizes the Micro-USB plug as an input device and allows you to plug in whatever you want. Standard driver issues exist, but I personally had no problems with my Alfa wireless cards working…just be prepared for degraded battery life! You can pick up an OTG cable on Amazon or anywhere else VERY cheap! If you have to follow the Pwn Pad use case, pick up a TPLink USB wireless wherever you choose. I even tested a powered USB hub successfully and had several devices running simultaneously, though power became an issue. hey Evan not sure if you still doing this but as I plug my Alfa over my Pwnie pad (nexus7 2013) it recognizes in lsusb command but doens't appear over iwconfig... should I do something else than just plug it with my OTG cable like get a powered otg?